Miss Dot's Cupcake Spot: Christmas Cupcakes! Been wondering what I've been up to lately? 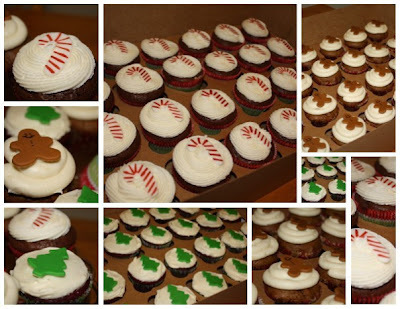 Well, one of my most recent days was filled with 12 dozen cupcakes for an order I baked for a Christmas charity event. The hubbs' favorite? Gingerbread, of course!! How do you bake for Christmas? Yum - they all sound delish! OH WOW! I think I gained a pound just reading this post. Cupcakes are so my weakness! I love them. I just made a Peppermint bark candy tonight. It is so yummy. I got it from a fellow bloggers site. Nice to meet you by the way:) I think I will become a follower now. Yummy! Your cupcakes sounds delish and are so adorable (as always)! Oh man, I just got all excited because I did not burn cookies for the first time in my 50 years. ::hanging head:: May I pretty please have a gingerbread cuppycake??? Hi! I just wanted to let you know that you were nominated by me for three awards! You don't have to accept them, I just wanted you to know that I appreciate your blog! Please go to my post http://makeupbylaurenp.blogspot.com/2009/12/three-new-awards.html to pick up your awards! oh these look so yummy. I love cupcakes!!! Snag a Bite of this Button!! Using "Lucky" by Amanda Heimann.